DuckTales comes home on Disney DVD on June 5th with DuckTales: Destination Adventure!. If you’re an 80’s/90’s kid like me, you remember days of The Disney Afternoon. I lived for DuckTales and the other cartoons we loved in those days. Who doesn’t love to sing the final words of the theme song? Woo-oo! 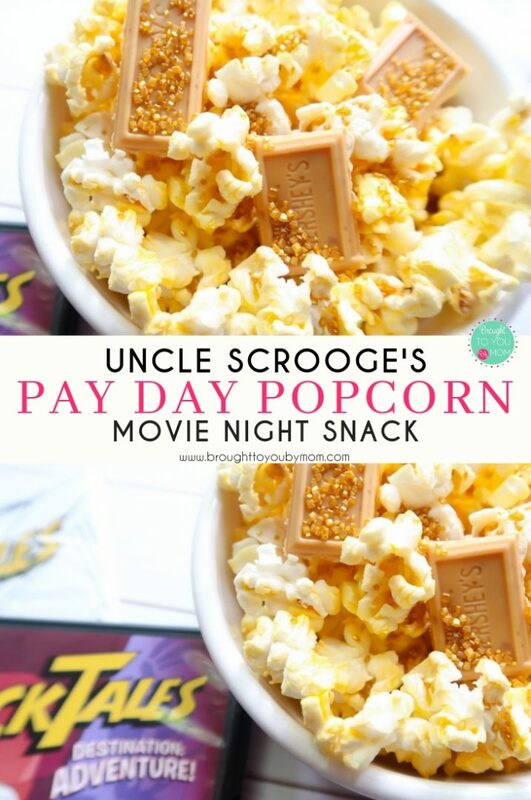 With the recent reboot of DuckTales and this new DVD, our family has been ready to enjoy episodes at our fingertips with our favorite DuckTales snack for movie night: Uncle Scrooge’s Pay Day Popcorn. In DuckTales: Destination Adventure!, an ancient tomb in Toth-Ra, the mountain peak of Mt. Neverrest, a vacation island for Greek gods…global expeditions await! Huey, Dewey, Louie and Webby, trillionaire Scrooge McDuck are back in action, leading the way to death-defying exploits stretching all the way from Duckburg to legendary destinations around the world. For those of us who are nostalgic to our childhood, there are even two bonus classic episodes! I’ll say it again, “Woo-oo!”. Can I just say how much I adore Launchpad McQuack? Let’s get ready for the June 5th release of DuckTales: Destination Adventure! with our DuckTales Snack: Uncle Scrooge’s Pay Day Popcorn. Pop your favorite popcorn and fill heaping sizes into serving bowls. Let the popcorn cool for a few minutes. Break off HERSHEY’S GOLD Caramelized Crème Candy Bar into the rectangular pieces and place in the popcorn. Sprinkle gold sprinkles over the top to complete the look. Enjoy your Uncle Scrooge’s Pay Day Popcorn for your DuckTales: Destination Adventure! movie night!